So after we landed, and found Brandon and Erika, and I stopped drooling over the cars (Ok, I never stopped drooling over the cars) one thing became obvious, Germany is very old. Dan would argue that we only saw the Bavarian part of Germany and that the rest of Germany is not like that. I can only blog what I have seen, so I will stick with Germany is old, but that is not a bad thing. Most of our site seeing was in and around Hohenfels because we didn’t really want to spend 6 hours on a train with a one year old, so we saw a number of very old towns with very old churches and bridges and center squares. I am not even going to attempt to give a history lesson on each one, Wikipedia does a much better job and Erika does an even better job. For most of the trip I wondered around taking pictures of as much as I could without much understanding of what I was taking pictures of, this drove Erika crazy because she was doing an expert job of being a tour guide and I kept wondering off from the group. I tend to be less interested in why or when something was built and more interested in the detail of how it was built and there was no shortage of detail. Everything was just so ornate and (insert synonym for insanely detailed here). No one builds things this way any more and no matter how many picture I took I could not do any of these builds justice, you just have to see them with your own eyes. To go along with the beautiful sights I enjoyed a number of delicious beers. Now, I have never been to Ireland, though my wife has, and I have been to the Czech Republic and even though I don’t remember much of my time in the Czech and I only partly trust my wife’s taste in beer I can say with certainty that neither place’s beer can hold a candle to what Bavaria brings to fest table. The following is a list of the place we visited, click the “pics” link to see all my pictures, because I didn’t want to fill the post with a million links. Click the “wiki” link to actually learn something about these places, remember I kept wondering off from the group. This is where I learned a new word…dunkel. Dunkel is a dark lager with a smooth malt flavor popular in Bavaria and it is the most wonderful thing I have ever tasted (period). This is also where we saw the Rathaus-Glockenspiel and it is home to BMW, again that will be the topic of another post…hopefully. Velburg is a nice little town with a castle ruin up on a large hill…a very large hill. The view from top was spectacular. We did not drink any beer here, but it was still a very interesting town. Regensburg is fairly close to Hohenfels, so we actually went there twice, the first time to have Indian food for diner and to buy some vinegar in one of these neat little stores. I am sure I had a beer with diner but I honestly can’t remember so it must have only been OK. This is also where we saw the Dom and the Danube river. I had actually forgot the memory card to my camera the first time we visited, so I am glad we went back. I ate braised boar knuckle and the largest potato dumpling thing in the world and sour kraut that I really liked. So I don’t hate sour kraut, just the crap they try to pass off as sour kraut in the states. 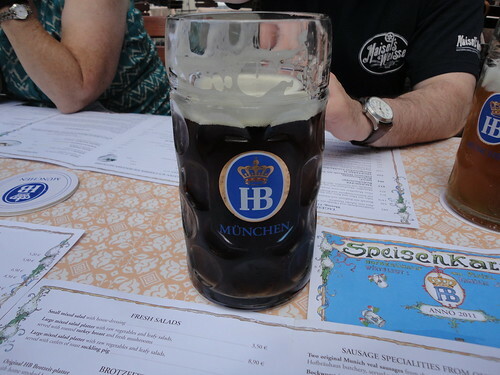 I finished off the kraut with another wonderful dunkel, this became a common theme of our trip. We saw the Frauenkirche and “The Beautiful Fountain”,were Gillian and Linda spun the gold rings for good luck. They was also a few other interesting fountains. Then we climbed up to the castle…I don’t know why they had to put all these castles way up on top of hills. Grossbissendorf is the small village we Brandon and Erika live. I say village because saying it was a town would imply that people live there. Linda swore the entire time that no Germans actually lived there and everything was just staged to look like a town… it was small. It was right out side the Army base in Hohenfels were Brandon was stationed. The base is mostly a training huge (I say huge, Brandon says it isn’t really that big) facility large enough for tank maneuvers, complete with mock Afghani town. Brandon kept the house fully stocked with a number of types of bees and this had nothing to do with our visit, he is just a man who enjoys beer…we get along quite well. Cinderella’s Castle, this was the most touristy place we went, I am glad our whole trip wasn’t like this day. Don’t get me wrong it was a wonderful day and the castles were amazing, but being around that may other tourists took the “German feel” out of everything. The beer even tasted less German. This is where we meet up with Dan and Ines. We visited them at Ines’ sister’s (Ellen) and brother-in-law’s (Jens) house and attempted to go to a festival, but after fighting the rain and riding bumper cars, we decided to head back to the house and grill lots of meat, which is funny because Ines is a vegetarian, oh and yes there was plenty of top-notch German beer. Jens and Ellen also have a daughter, Nelly, that is just four days younger than Elena, so now we can say that Elena has a playmate in German. We had a great time just hanging out and telling stories and playing a horrible game of horse and table tennis, table tennis is huge in Germany. I can not thank Jens and Ellen enough for the hospitality, it was one of the best days of the entire trip. This is where we bought Elena one of those European baby bandanna things that all the trend setting German Babies seem to be wearing. Actually when I say “all those” I really just mean Nelly, I think she may have been the only other baby we saw anywhere the entire trip. As far as I can tell Germans will become extinct in about 20 years because no one is propagating the species. Every place we went Elena was nearly the only baby or child, though surprisingly all but one place had high chairs. We also visited a monastery with a crazy beautiful church and a nice little brewery, the Dunkel was delicious! The Walhalla Temple was an interesting place, basically it is a crazy building up on a hill full of stone heads. Ok, the are actually stone bust a number of historically significant Germans, Einstein is in there, but I think the more impressive part is the view. The hill over looks the Danube river and it is worth the hick up. Rothenburg is one of the only midevil towns with a still intact city wall. I believe it was so well-preserved because it was also extremely poor and no one really wanted to attack it, that may not be true. Rothenburg is also home to a torture museum, I mean “Mid-evil Crime and Punishment Museum” which I found incredibly interesting but also felt a little odd carrying my 14 month old daughter through. There was what seemed to be an elementary school field trip also going through the museum, so I guess it wasn’t that odd. That was the largest single group of children we saw during our trip…in a torture museum. The night before our trip to Rothemburg is when I got the e-mail offering the job that I have now been at for a month and a half. Everything after this point is a bit of a blur because I was having a mild panic attack for the rest of the trip. This was our last trip while in Germany, Weltenburger is the monastery/brewery that makes the beer Brandon keeps stocked in the house. So I was looking forward to that, except getting there involved a half an hour boat ride. For those of you how don’t know, I am prone to sea sickness…and car sickness…and plane sickness, and I am not a fan of those carnival rides that spin around and around. Though despite the boat ride and that fact that my stomach was already doing somersaults over the job offer, I kept is all down and did enjoy myself. So that is our trip in a very large nut shell. Our trip was hands down one of the best two weeks of my life and we are truly blessed to have such great family and friends. German is not a place I am just going to cross off my list. With your ambrosia-esque beer, beautiful, technologically advance, enthusiast minded cars and amazing unlimited roads, German you have ruined me and I will be back some day. This post is most likely wrought with inaccuracies, grammar errors and misspellings but I really just needed to finish it so I could move to things like getting new jobs, selling our house, moving to Omaha, life in a basement, international business trips,and oh did I mention my mom is getting married? So, all of that and more in my next installment, and I am sure I will get around to explaining is agonizing detail the awesomeness of the BWM museum/plant/world. This entry was posted on October 22, 2011 at 3:38 am and is filed under Rants, Trip. You can follow any responses to this entry through the RSS 2.0 feed. You can leave a response, or trackback from your own site. Regensburg…not Renesburg, I would say I can’t believe I misspelled it three times, but I can.